I stopped at The Fresh Market to pick up a few specialty items and came across this little gem…Tumaro Garden Veggie Low-in-Carb Wraps. I love making different kinds of wraps, breakfast burritos, specialty soft tacos, pizzas, and other Mexican dishes. Wraps are so versatile as you can make many healthy low carb dishes with them. This wrap has a great taste, pliable and few in calories, carbs, fats, and sugars. They are also high in fiber. Tumaro’s low-in-carb wraps come in a variety of flavors such as honey wheat, whole wheat, sun dried tomato, multigrain, and several others to choose from. All of them are only 60 calories with very few carbs and less than 1% of sugar which makes them diabetic friendly. 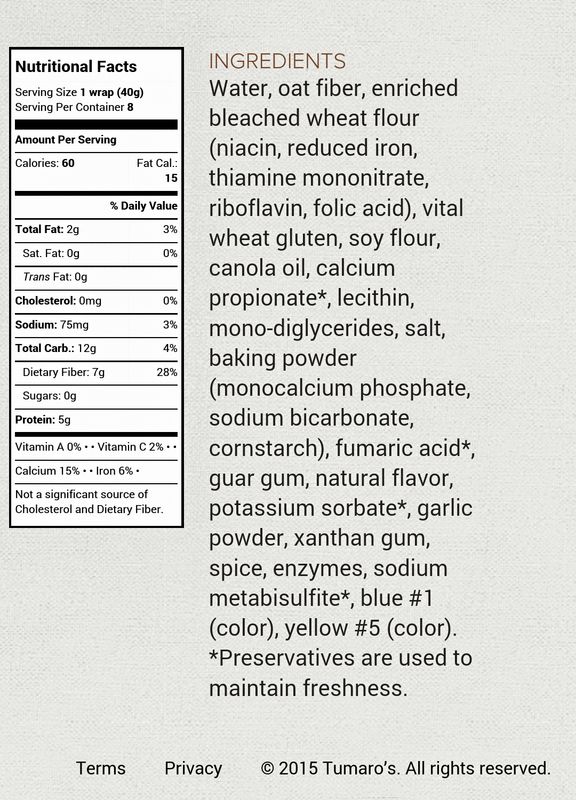 Read the label below for the garden veggie wrap ingredients. These wraps definitely get a stamp of approval from me as one of my fantastic food finds. Go to http://www.tumaros.com to find a retailer near you. I can’t wait to come up with some more fabulous recipes for you all to try and for you to try them with me.